How do I register on wechange.de? 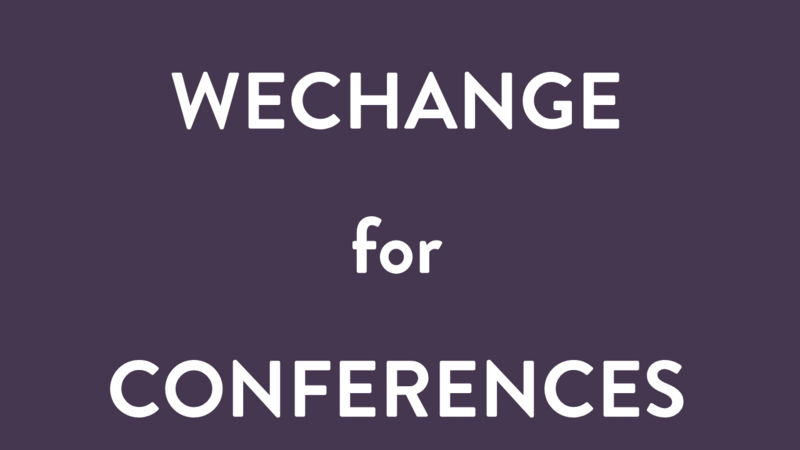 You register by filling in your emailadress and your avatar into the form on https://wechange.de/login. After the activation of your account by the administrators you will recieve an email with an activation link. As soon as you logged in afterwards and set your password you will be able to set up your profile, join a project or create one. My email address is already used, how is that possible? You are most probably already registered on the plattform. Try to log in (if you didn´t try yet). If necessary you can backout your password. If the provided member information looks new to you, your email address might have been mistakenly used by another member. In that case please inform us via email support@wechange.de. 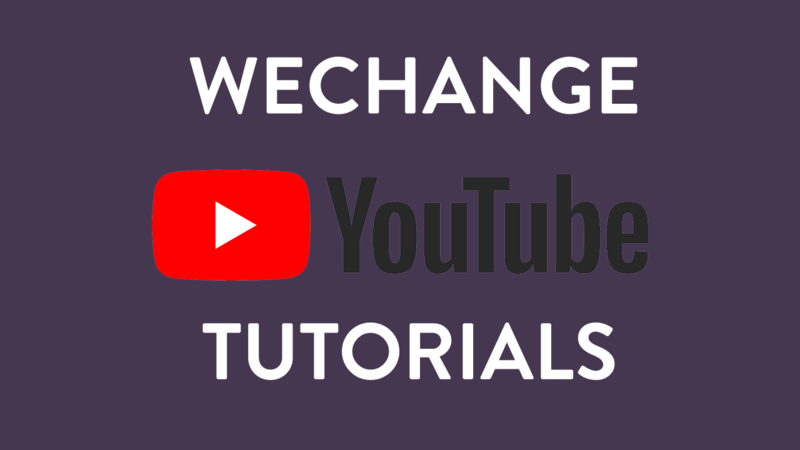 How do I log on to the wechange platform? You can log on to the wechange platform by entering your access data on https://wechange.de/login or by clicking the button „Log in“ on the top right corner of the website. If you haven´t registered yet please sign up on https://wechange.de/signup/ . Please note: the option “Individual notifications” involves more effort, but that way you get exactly the information that is important to you. By clicking on the profile picture in the top right-hand corner, you can find the option on the drop-down menu ‘log out’. On the login page https://wechange.de/login, click on the menu on the left on the option “Forgotten password”. It opens in a new window. Here you need to give your e-mail address and instructions on how to change your password will follow in an e-mail. Click on the profile picture in the top right-hand corner and you will find the option “My Profile”. Click on “Edit Profile”, then on “Change Password” (in the left menu bar). This will open up a new window, where you must first give in your old password and then the new password twice. Click on the profile picture in the top right-hand corner and you will find the option “My Profile”. Click on “Edit Profile”. Here you will find all your basic information, including your e-mail address. Just fill in the new e-mail address here and then click on “Save” below. How do I change my name, profile picture, location and interests? Click on the profile picture in the top right-hand corner and you will find the option “My Profile”. Click on “Edit Profile”. Here you will find all your basic information and can change, for instance, your e-mail address, name, profile picture, location and interests. Who can see my profile and how can I change these settings? Team members only: your profile is only visible to others in your project. You will not appear in the list of “People” in the overhead bar. Logged in members only: all users who are logged in to wechange.de can see your profile. You are shown in the list of “People”. Everyone: Visitors who are not logged in can also see your profile. How do I delete my profile and user account? Click on the profile picture in the top right-hand corner and you will find the “My Profile”. Click on “Edit Profile”. By clicking on “Delete profile”, your user account and all the information deposited in it will be irrevocably deleted. Access to your groups and projects is then no longer possible. Caution: In case you are registered to other portals with the same user account, the deletion affects these portals too! If you would like to leave a project or a group, select instead in the corresponding space, “leave”, without deleting your profile. How do I change the language and in which languages is wechange.de available? On the right-hand side of the menu bar on the top side of the screen there is a language toggle, that is by default set to German (DE). With a click on this setting, you can change the language to English, Russian and Ukrainian. Caution: Content created by users stays in the original language and is not translated. What is the difference between Groups, Projects and the Forum? Group: With a group, you can create a digital space for internal organisation, planning and knowledge exchange with other people. Within a group, any number of Projects can be set up, by the whole group or just a part. In a group, you can find the following functions: news, calendar with event function, task management, data storage, documents (Etherpads) for collaborative writing of texts and tables, as well as a market place function. Project: Projects are subunits of a group. Projects always make sense then when within a group many different activities are being organised, which are of limited duration or only affect a portion of the group. A project can be created by users themselves and project-admin independently managed and also be deleted again. It has the same functions ready to use as a group. 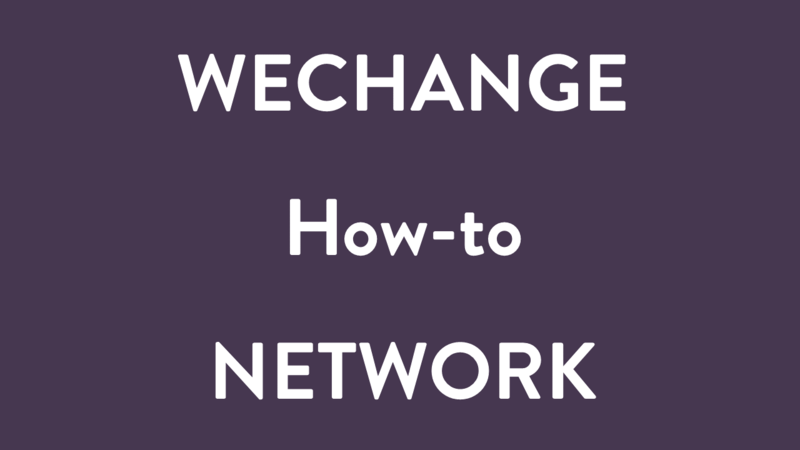 Forum: The WECHANGE-Forum serves as a place – across the platform – for networking and exchange of news. Formally it is a group, to which all WECHANGE users are automatically added. The Forum also contains the standard group functions. How do I create a new project and what should I be aware of? Click on the project overview at https://www.wechange.de/projects on the left-hand menu “Create Project”. You then have the possibility to enter the name and location, to choose suitable tags for its subject category, to assign the project to a group, to upload a project logo and to change the visibility settings. (Please note: For the project to be easily found, it is helpful to use the logo of the group it belongs to and a project name following this pattern: Group | Project xy). How can I subsequently change project details? Click on the Project overview at https://www.wechange.de/projects on the left-hand menu “Create Project”. You then have the possibility to enter the name and location, to choose suitable tags for its subject category, to assign the project to a group, to upload a (another) project logo and to change the visibility settings. How can I deactivate a project or delete it? If you are the Administrator of a Project, you can deactivate a project in Project Settings (a later reactivation is generally possible, see “How can I reactivate a deactivated project?”). If all information should be irrevocably deleted, contact system administration. The desired project and all the information belonging to it, will be completely and irretrievably deleted from the system. How can I reactivate a deactivated project? In order to reactivate a deactivated project at a later date, contact the system administration and give the details concerning the project. The old data and all project members will then be once again available. How can I adjust the visibility of my project? Only Groups/Project internal: the content of the group/project are only visible to logged-in people in your group/your project as standard. Public (visible without being logged-in): the content of the group/project are visible for everyone (even without registration on wechange.de). In the project overview, the project is then labelled as “Public”. How can I invite more people to a group? Only group administrators can add more people, who are registered on the platform, to the group. People interested in joining the group can click on the “Join now!” button on the group’s microsite. The group administrator will then be informed and can either accept or decline the application to join. In addition, people can also be directly invited into the group by group members via an e-mail invitation. How are Group Administrators assigned or changed? The person who set up the group is automatically an admin. There must always be at least one Group Administrator, but there can also be more admins, or indeed all group members can be made administrators. This happens by the admin going to the Members Overview, and on the far right, next to the name of the corresponding person, clicking on the downward pointing arrow and changing the status to “Admin”. What is the microsite and how can I use it? The microsite is the publicly visible welcome site of every project and every group. It will be shown to every person who is not registered or logged in. Here, you can present your project or group for external people and display the most important information (group/project logo, description, contact, location, topics). How can I adjust what is shown on the microsite? What is or is not shown on the microsite is determined by you. On the left-hand foldout menu, next to “General Settings”, there is an extra space for the microsite. How can I create a new event? Click in the group/project overview on “Events”. A large calendar will open up. In order to add a new event, either click on the corresponding day or enter in the event title in the box underneath the calendar and click on “Create”. After that, you can fill in all further details in the corresponding fields. Events can be changed only by the creator of the event or portal administrators. By clicking on the downward-facing arrow to the far right of the calendar entry, a menu opens. There you can select “Edit” and change the event. How can I adjust the visibility of an event? An event set to Forum can be seen by all logged in wechange.de users. If you have created an event with in your group/your project, the event is only visible to logged in members of the group/project. If you would like your event to be visible for everyone, choose the option “public” in the “Visibility” menu. The event will them be available to everyone on the microsite of your project or group. Can I move events from my group/project to the Forum or to other groups/projects? No, unfortunately that is currently not possible – but we’re working on it. How can I agree a date with others? In the group/project overview, click on “Events” and then in the left-hand menu list on “Event Polls”. A new page then opens, on which you can give the title for the event and select a time. You can also select more than one day, or a regularly repeating day. Every logged in user in the project/group will be informed and can accept or decline the invitation. Upon calling up the event, there is a dropdown menu with the following possibilities: “Going”, “Maybe going”, “Can’t go” and “No choice”. For public events, all logged in wechange.de users can enter in their (non-)attendance, even when they’re not in the group/project. 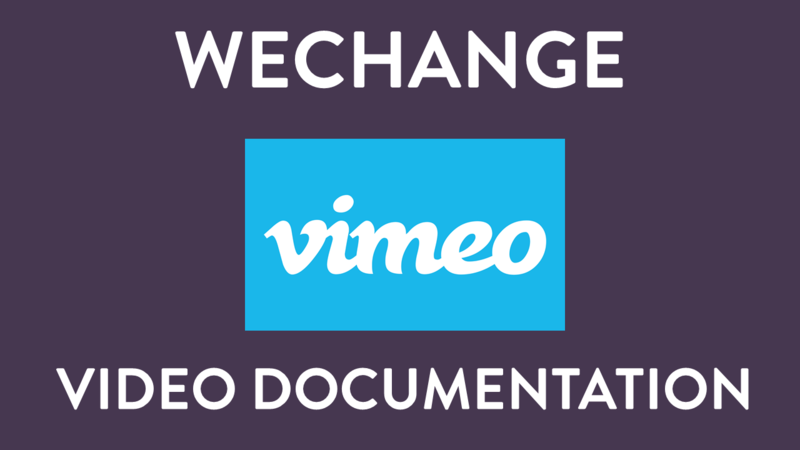 Can I collaboratively create documents and tables in real-time on wechange.de? Yes, that is possible. In wechange.de, you can find the function under “Documents” (also called “Pads”). The open-source programme linked in there, “Etherpad” (for text documents) and “Ethercalc” (for tables) allows all logged-in users in a group/project to simultaneously access and edit the content of a text document or a table. Who can access and edit a Document/Pad? All logged in users in the group/project where the document was created can read and edit it. Should editing of a document not be possible, click on “Edit” or the pencil symbol in the right-hand corner of the document. How can I save a document (Pad or Table)? There is no Save button, since Etherpad (Text) and Ethercalc (Tables) automatically save all changes in real-time. In order to go back to earlier versions, there is a “History” function (click on the clock symbol). Via the time list there, you can access earlier versions. You also have to possibility to mark versions with stars in order to find them more easily in the list. Why are entries highlighted in different colours and how can I change it? Every person who edits a document automatically receives their own colour, with which their entries are highlighted. In that way, you can recognise who has written what. The colour can be changed with a click on the coloured box next to the author’s name. On the cog wheel on the menu bar, you can select whether author’s colours are generally hidden or shown. With the eye symbol “Clear authorship colours”, you can irrevocably remove the shading for a selected part of the document or the whole of it and turn everything to white. What is the difference between "Documents" (Pads) and "Files"? Where and how can I upload files? Files can be uploaded in all groups and projects. To upload, choose “Files” in the collapsible left-hand menu bar. Here you can select files or directly via Drag & Drop upload files to the desired area. What file types/formats can I upload? Essentially, any kind of file format can be uploaded, for instance PDF files, photos etc. Whether other users can open them, depends on whether they have installed the necessary programme to open such files. Can I also upload whole folders with content? Yes, the uploading of folders together with subfolders and files is possible (depending on the browser, currently only with Firefox 50+, Google Chrome and Opera). Who has access to the files and how can I adjust the settings? Only me: no-one apart from yourself has access, neither other users from your group/project, nor anyone else. Team members only: other than you, only people from the group or project where the file was uploaded have access. Public (visible without login): the file can be seen and downloaded by everyone, even by people who are not part of the group/project or who are not registered on wechange.de. Please note: there is no differentiation in who has the right to read and who has the write to edit. Everyone who has access can find, open, read, download, rename, move, delete or overwrite files. How can I integrate the calendar with calendar programmes on my smartphone or tablet? Copy the URL from the calendar and download it.